A protein that plays a powerful role in learning and memory may be a key to improving treatment of a rare autism spectrum disorder called Pitt-Hopkins syndrome (PTHS), a new study suggests. 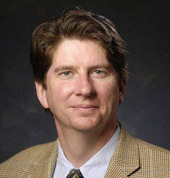 J. David Sweatt, Ph.D., the new chair of the Department of Pharmacology in the Vanderbilt University School of Medicine, has been studying the protein, called transcription factor 4 or Tcf4, for several years. In a paper published this week by the journal Cell Reports, Sweatt and his colleagues at the University of Alabama at Birmingham (UAB) report that mice deficient in Tcf4 exhibit impairments in social interaction, vocalization, learning and memory characteristic of PTHS. The impairments were “normalized” when the mice were given small-molecule drugs called HDAC inhibitors, which alter Tcf4-associated gene expression in the brain. The finding suggests that “broadly acting, epigenetically targeted therapeutics … might be particularly beneficial in PTHS patients,” the researchers concluded. “We are quite excited by these findings, said Sweatt, a Vanderbilt University-trained pharmacologist who formerly chaired the Department of Neurobiology and directed the McKnight Brain Institute, both at UAB. Epigenetics refers to environmental factors that affect DNA transcription, the read-out of the genetic code, and thus gene expression. For example, histone deacetylase (HDAC) enzymes help regulate the way DNA is packaged and transcribed in part through acetylation, by adding acetyl groups to the histone proteins that coordinate gene structure. Transcription factors like Tcf4 adjust the transmission of signals across the synapses, or gaps between nerve cells, a phenomenon known as synaptic plasticity. A type of synaptic plasticity called long-term potentiation, or LTP, is associated with the brain’s ability to learn, acquire language and lay down memory. It’s been known for some time that Tcf4 exerts its effects on transcription by attracting HDACs. Drugs called HDAC inhibitors have been long used in psychiatry and neurology to stabilize mood and prevent epileptic seizures. More recently they have been studied as possible treatments for cancer, Alzheimer’s disease and depression. Through their mouse model, Sweatt and his colleagues connected the observed effects of Tcf4 and HDACs on gene expression in the brain. Their study adds credence to the notion that chemical modification of DNA and DNA packaging can result in to long-lasting behavioral change, even post-developmentally. Future studies are planned to further investigate the possible use of currently available FDA-approved HDAC inhibitors in the Pitt-Hopkins mouse model, Sweatt said. The study was supported by the Defense Advanced Research Projects Agency (DARPA), the National Institutes of Health (grants MH57014 and MH104158), Civitan International, the Simons Foundation, McKnight Brain Research Foundation and the Pitt-Hopkins Research Foundation.